Please welcome today's paranormal guest author Lisa Phillips! Lisa is the author of Obsession Everlasting and Knight Everlasting . Lisa: I began writing short stories in spiral-bound notebooks when I was nine. I read The Secret Garden, and decided I wanted to be an author when I grew up. I was encouraged by teachers all through school, especially a high school English teacher who told me he wouldn't be surprised to see my name on the cover of a novel one day. But, it took another twenty years after those words of encouragement for me to seriously pursue getting published. I still pinch myself sometimes when I think about a dream I had for more than thirty years has finally come true! Lisa: I have always loved anything surrounding the paranormal. I watched Dark Shadows with my grandmother when I was a kid, and when I read Interview with the Vampire in high school, I fell even more in love with the lore and lust of vampires! I'm also a fan of Celtic history and lore, so I enjoy stories with magical aspects as well. Basically, I'm a paranormal junkie all the way around! Lisa: Knight Everlasting is the second novel in my Everlasting Trilogy, so I hope readers will enjoy the continuation of the story of a faction of vampires living in sultry Savannah, Georgia. Tristan is an ancient vampire, who was once a thirteenth century Celtic knight, trying to restore peace to the eternal realm. Katie is Tristan's fledgling. She vows she will avenge the deaths of her beloved family at the hands of a dark faction, and is determined to prove to Tristan she is ready to fight at his side in the coming battle for power in their realm. Readers will also get to catch up with Simon and Fallyn, the main characters from Obsession Everlasting, the first novel in the Trilogy, as well as meet Sidney and Ryder, two new characters joining the faction. You can read excerpts from both Obsession Everlasting and Knight Everlasting on my website, as well as get a sneak peek at the final novel of this trilogy, which I'm currently working on. 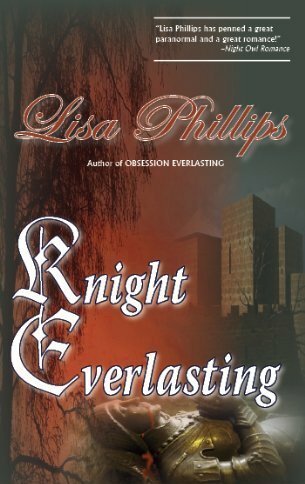 Knight Everlasting (Everlasting, book 2) by Lisa Philips. Once a medieval knight, Tristan McBreen is now Vampyre. Thriving and hidden in the lush romance of Savannah, Georgia, he has pledged his sword to those of his kind who will not feed on the innocent—though his quiet heart belongs to a fledgling who could well pay the ultimate price for his views. Now he must find a way to restore peace among the Vampyre—without sacrificing a love that could be his only salvation. … and a New Love is at Stake. Katie O’Reardon gladly surrendered her mortal soul to the darkness. Now better suited to avenge the deaths of her family, she is eager to aid those who helped her survive. Before facing a monster who hopes to use her as a pawn in his evil game, she must first prove to Tristan that she's prepared for the battlefield—and ready to be the match for this knight’s everlasting heart. Thank you Lisa for joining us here at From the Shadows! To learn more about Lisa Phillips and her books please visit her website. What a great interview Lisa and E.J. These books are so compelling and tell a tale that is captivating. I wish you much success. I loved Dark Shadows too as a kid and couldn't wait for it to come on in the afternoon. Who knew that Barnabus Collins could be so alluring! LOL I also know how you feel about being able to pursue your dream as a published author. What a rush, right? Keep the good stuff coming Lisa. I love vampire stories and your trilogy sounds amazing Lisa! Always nice to meet a fellow fang fanatic! Thanks for stopping by! Not enough hours in the day to thank you for all you do to support authors! And hope you know how much inspiration can be derived from trying to make you giggle! Nice interview. I've got your books on my 'to buy' list. Can't wait to read them. I bet I know some of the authors on your 'to buy' list. And I appreciate being in such fine company! The interview was awesome! Thank you so much for sharing! I'm a Dark Shadows girl as well! What an inspiration you are! I loved Obsession Everlasting and can't wait to read Knight Everlasting. It is on it's way. Keep doing what you're doing my friend - the best is yet to come! I appreciate your friendship and wonderful stories - both have been a blessing to me.